I mentioned before that my dad was a drummer back in the Big Band days. 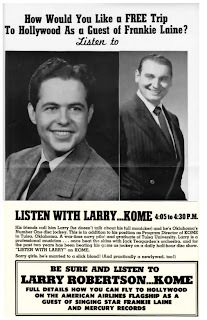 I also mentioned that he was a radio DJ, as well as program manager, at the old KOME radio station downtown. Recently I ran across some KOME stuff that I thought I'd share. Earlier, I referred to my dad doing "Man On The Street" interviews. I was mistaken. 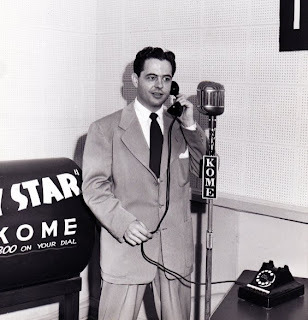 They were called "The Inquiring Reporter" interviews. I stand corrected now. In this letter, he also refers to interviewing Yvonne DeCarlo, saying she "was very nice". 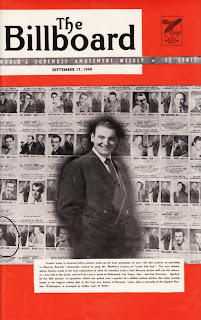 Mercury Records held a nationwide contest in 1949 using 100 disk jockeys from all over the US to help plug Frankie Laine's new single "Lucky Old Sun". Listeners were to send in their explanations of what they thought Mr. Laine's best album was. The winner (and the DJ) would win a trip to Hollywood, Las Vegas and San Fransisco as Laine's guest. This photo from the same time. 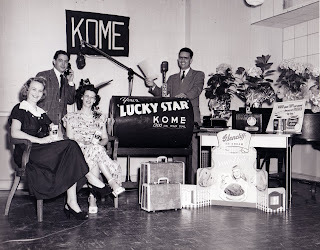 Sponsors of the "Your Lucky Star" drawing/call in were: Edwards Coffee, Glencliff Ice Cream and the ladies are holding what appears to be Emot Pin Curl.....? I know what pin curls are (thanks Mom) so this must have been something you put on them to make them hold (for us it was Dippity Doo). There is also some luggage and an Andy Russell album on the table. I'm guessing that these were consolation prizes, perhaps? A fellow by the name of Jim Hartz has posted photos of the old KOME station (in its present decaying state) on the flicker website here. I'm pretty sure that photo #23 is the same place as the above picture was taken. 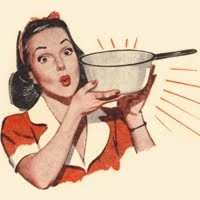 Nancy, I received a blogging award that I passed on to you. AND....when I read that flyer with Dad and Frankie's pictures on it to mom, and got to the part about "Sorry girls, he's married-and to a slick blond!" my mom's reply? "They're probably divorced by now!" My dad was standing in the room and said, "Margaret-they're talking about YOU!" We had a good laugh over that for many years. Your banner of the Fairgrounds Pavilion detail is stunning!!! Well done.